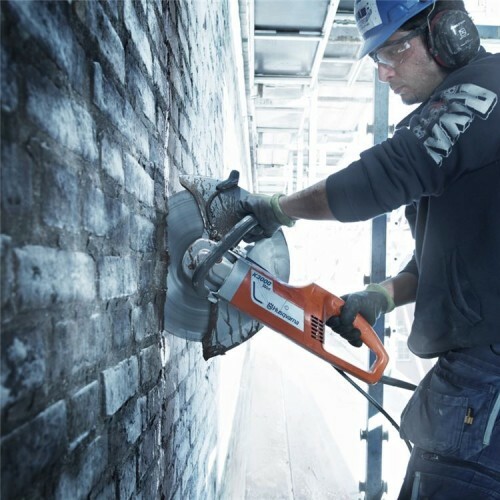 The K4000 is Husqvarna's latest pioneering 110V electric disc cutter with high power output and low noise levels. The improved 2200W motor is powerful enough to deliver the right amount of power for the task at hand, without jamming or kick back. As with all electric machines, it is more suited for indoor projects and working in sensitive working environments without the noise and fumes you might associate with petrol models. This machine is a powerful, versatile electric cutter with wet cutting kit for both wet and dry cutting. It is ideal for smaller cutting jobs indoors with a minimum of dust and slurry. By using the wet cutting kit with specially designed nozzles in combination with double insulated rotor and GFCI, (Ground Fault Circuit Interrupter), this combines the advantages of an electric power cutter and efficient dust suppression. There is advanced electronic overload protection system which varies the rotation speed to warn of approaching overload. This electric concrete saw is equipped with a dust extinguisher system DEX. This means it has integrated water regulator which controls the water volume. This ensures there is an amount of water that is just enough to bind the dust. When wet cutting, water volume is regulated for a consistent flow to the blade. Hassle-free operation is achievable thanks to the convenient location of the power cable, so it does not interfere with the trigger button. Small incremental improvements to the layout can really improve the user experience, so that you can complete the task with maximum comfort. Servicing and assembly are further simplified since the previous K3000 model, with Torx screws and a one-piece inspection lid. Carbon rotor brushes help to increase service intervals so you can spend more time cuting and less time waiting. With the Elgard™ system, the rotation speed is dynamically varied in order to protect against overload. This electric power cutter had a high level of durability, with low noise levels and minimised loss of power.